Shiny Charmeleon in game: 123 Who? Important notice! Pokemon Shiny Charmeleon is a fictional character of humans. Charmeleon (Japanese: ??—? 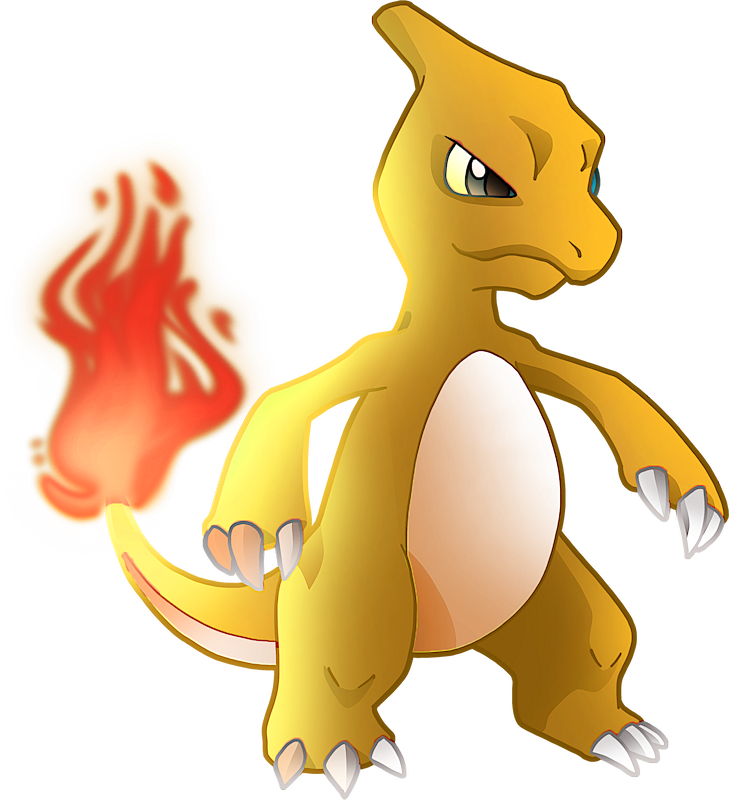 Lizardo) is a Fire-type Pokémon introduced in Generation I.
Charmeleon is a bipedal, reptilian creature. It has crimson scales and a cream underside. There is a horn-like protrusion on the back of its head, and it has narrow green eyes and a long snout. It has relatively long arms with three sharp claws. Its short legs have feet with three claws and cream-colored soles. The tip of its long, powerful tail has a flame burning on it. The temperature rises to unbearable levels if Charmeleon swings its tail. Ash's Charmander evolved into Charmeleon in March of the Exeggutor Squad. It quickly grew unruly and disobedient and evolved into Charizard soon after, in Attack of the Prehistoric Pokémon. 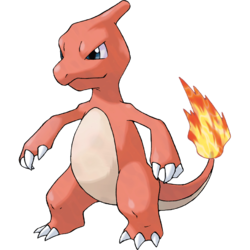 Ritchie's Charmander, nicknamed Zippo, evolved into a Charmeleon off-screen and was first seen in its evolved form in A Parent Trapped!. 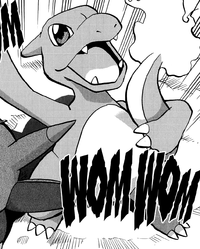 A Charmeleon appeared in a flashback in Mega Evolution Special II as the unevolved form of Alain's Charizard. Trevor's Charmeleon appeared in A Legendary Photo Op! after having evolved from a Charmander. It has since evolved into Charizard. In The Crystal Onix, Mateo used a Charmeleon to make glass and battle the titular Crystal Onix. Sam used a Charmeleon in Celebi: Voice of the Forest to battle the Iron-Masked Marauder. A Charmeleon also appeared under the ownership of a Trainer named Jimmy in Judgment Day. A Charmeleon was seen on TV in The Breeding Center Secret. A Charmeleon belonging to a Coordinator appeared in Once More With Reeling! participating in the Terracotta Contest. 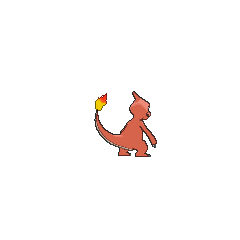 A Charmeleon appeared in SM003, as a silhouette. EP043 Charmeleon Ash's Pokédex Charmeleon, the Flame Pokémon. It has razor sharp claws and its tail is exceptionally strong. Charmeleon debuts in Onix is On!, part of the Red, Green & Blue chapter, battling in the Pewter Gym as one of Blue's Pokémon. It evolved from Charmander sometime between The Secret of Kangaskhan and this round. When Red and Blue collided in Celadon City, Red mistakenly picked up the Poké Ball of Blue's Charmeleon, but he managed to give it back to Blue later. It has since evolved into Charizard with Blue's harsh training, and became even more powerful, assisting in the defeat of both the Team Rocket triads Koga and Sabrina, and continued to act as the powerhouse for both Blue and Red, in the two times it was (temporarily) traded to him since then. X's Charmander, Salamè, later evolved into a Charmeleon alongside Marrisso who evolved into a Quilladin in PAXY22. 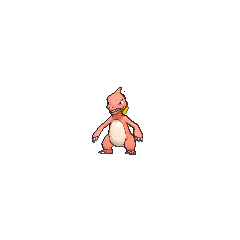 Charmeleon resembles a small dinosaur with remnants of Charmander's salamander-like appearance. Although its nomenclature suggests commonality with the chameleon, Charmeleon exhibits very few of the major physiologically distinguishing traits of the chameleon. 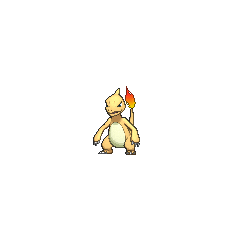 Charmeleon does not have the specialized zygodactylic feet, separately mobile eyes, extrudable tongue, or the ability to change color like some members of the chameleon species. The few characteristics it does share are the snout, a prominent head crest (which resembles a small horn in its Generation I back sprite), and extensive use of its tail. Chameleons have prehensile tails used for climbing and grasping, while Charmeleon utilizes its tail as a weapon. Cantonese Chinese ??? Fóhúnglùhng Literally "Fiery dinosaur"
Mandarin Chinese ??? / ??? Huokonglóng Literally "Fiery dinosaur"